The Latest concept in MOT Emissions Testing incorporating our Bluetooth CobraScan Vehicle Diagnostics, EOBD RPM and Engine Temperature Measurement, as Standard. Equipped with a compact, maintenance free Smoke Meter with Bluetooth connectivity the Innova 3500 is one of the most advanced MOT Emissions Analysers designed to test modern vehicle engine technology of today. The Innova 3500 is controlled by a powerful Intel based PC system, combined with 'fully digital' infrared gas measuring technology providing rapid analysis of a vehicles performance with pinpoint precision of exhaust emissions. Combined with the ATL Class 4 or Class 7 roller brake option, high resolution LED screen, qwerty keyboard and A4 laser printer, the Innova 3500 is the most versatile and 'user friendly' analyser for MOT testing and fault diagnosis of today. Supplied with Bluetooth CobraScan as standard, the digital EOBD adaptor is designed for use as a simple scantool device or as an RPM/Engine Temperature interface for MOT testing. The CobraScan simply plugs into the 16 pin EOBD socket to provide a live reading of Engine RPM and Temperature during the MOT test. In addition it can display and delete standard DTC (Diagnostic Trouble Code) stored in the vehicles ECU memory. All values and codes are displayed on the Innova 3500. Wireless Internet Ready, the Inonova 3500 has password protected IT access by our Engineers to diagnose and check settings, via internet, should any problems arise. It can also be used for your DVSA MOT reporting web portal. 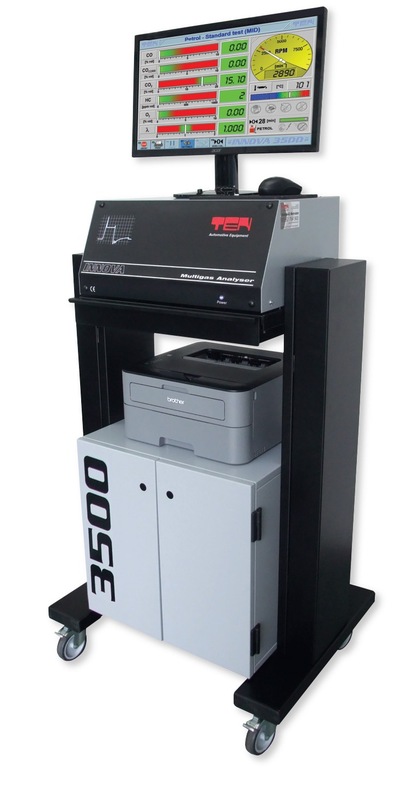 EDA 2000 Smoke Meter - This fully integrated and uniquely designed 'maintenance free' cell will provide the Innova 3500 with a facility to test 'high volume' diesel exhaust emissions with minimum cleaning and maintenance. Brake Tester Option - Approved for Class 4 & Class 7 MOT Testing. NOx - Electrochemical NOx Measurement Kit. * DVSA MOT Class 4 & 7 Approved. * Optional Range of MOT Approved Brake Testers.